Cupping provides medicinal and aesthetic benefits that have been used in many different cultures throughout the time. It includes utilizing flame to make a vacuum within a glass container. The glass is then applied to the skin. This suction created by the cup relaxes the muscles, relieves the pain, and draws the toxins out of the body. Depending on what problem is being treated, the glass cups can stay a maximum of 10 minutes on the skin. During a usual cupping treatment, we put several cups at the same time in a certain area of the body, and also apply some oils to help the glass cups glide easily through your skin. 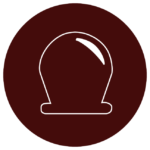 The facial cupping technique that we use in our clinic lifts and rejuvenates the facial muscles, while giving them a boost of energy. The procedure includes a soft rubbing of the face tissue which promotes the blood circulation and draining of the lymph nodes. We recommend this method as a powerful anti-wrinkle regimen which leaves the face looking well-rested and energized.